This week, we were in Cumbernauld to witness 2nd place Lady Rocks play host to 1st place City of Edinburgh Kool Kats in a top of the table clash. Lady Rocks came away with the hard-fought victory, defeating the visitors 78-73 and keeping their unbeaten run intact. In both team’s most important game of the season, the stakes were high as only one team would remain as the only unbeaten team in the women’s SBC. Rocks would strike first in the game as after they won tip-off Maela Faleu would find Lisa Haldane in the corner for the long two-pointer to give the home team an early 2-0 lead. The Kats quickly tied the game however, as Leanne Page found the basket on a floater after getting past her defender. Tracey Philips would then score the next 6 straight points for the Kats as she was relentless on the offensive glass, allowing her to pick up a number of second chance buckets. As both team’s began to feel each other out, the game was in neither team’s advantage with the game tied at 6-apiece. Kats then proceeded to take control of the game, going on a scoring run and outscoring Rocks 15-4 for the remainder of the quarter, giving them a double-digit lead by the end of the period. While Rock’s struggled to sink their shots, Kats’ offense ran like a well-oiled machine, which was in part credit to Leanne Page proficiently running the point. The run was spurned by Philips – who added another 4 points before the end of the quarter – and Emma Findlay who knocked down a deep three from the corner off the feed from Annie Rowan, and followed it up with a nice drive to the basket after beating Rocks’ Nadelle Strain off the catch. Casey Morrison finished off a solid quarter for the Kats, as she beat her defender at the three-point line and drove inside for the layup just before the clock expired, putting Kats up 21-10. Kat’s came out with more of the same in the second, as Findlay and Philips both knocked down shots to start off the quarter. However, Rock’s gradually began to narrow the deficit. Nadelle Strain was the first to answer back for the Rocks, pulling up from the free throw line and sinking the jumper. Carla Coll made a huge impact for the Rocks in the quarter, scoring 11 points in the period. Coll proved to be quite the difficult task inside for the Kats’ defence as she knocked down a number of turnaround jumpers from the post and was found on a cut to the rim by Erin Gilbride. Then, with Rocks still trailing 29-18, Coll hit the three-pointer to trim the score to single digits. With the momentum in the Rocks favour, they would continue to reduce Kats’ lead. A nice and-1 hook shot by Cathy Mitchell in the post brought Rocks to within four at 29-25. Erin Gilbride found her shooting stroke later in the quarter as she knocked down a deep three-pointer which glanced off the glass to bring her team within one point. After Leanne Page made a floater over her defender, Cathy Mitchell responded on the other end with a spin move that tied the game for the first time since the first quarter at 31-31. Emma Findlay then hit a three-pointer in the face of her defender only for Gilbride to answer back on the other end to tie the game once again. A foul on Carla Coll then put her on the line, where she made 2 free throws and gave Rocks the lead at 36-34. Tracey Philips would make the last shot of the half as she made a shot inside off an inbounds play, tying the game at 36-36 as both teams went to the locker room. Coming out of the gate in the second half, it was Cathy Mitchell who hit first for Rocks as she knocked down a jumper. Mitchell, who had struggled in the first half, would score 8 points in the third in what was a very back-and-forth quarter throughout. Rocks held the lead for the majority of the period but Kats made a late surge on the back of three triples from Emma Findlay including a three just before the buzzer, giving the visitors a 61-59 lead going into the fourth. After Findlay made the first shot of the final period, Rocks quickly tied the game once again as good feeds from the post by Carla Coll found Nadelle Strain and Erin Gilbride for the finishes inside. A turnover by Rocks, then lead to Philips making a long jumper to give Kats a 66-63 lead. However, Gilbride quickly responded with a tough three-pointer over her defender to tie the game once again. Following this, Kats struggled to hit their shots down the stretch and Rocks began to expand their lead at just the right time. After both teams went to the line and extended the score, Nadelle Strain would finish off the game for the Rocks, receiving a pass from a backdoor cut and finishing and then following it up with a clutch three from the wing off the assist from Gilbride to put Rocks up 75-69 with just over 2 minutes left. 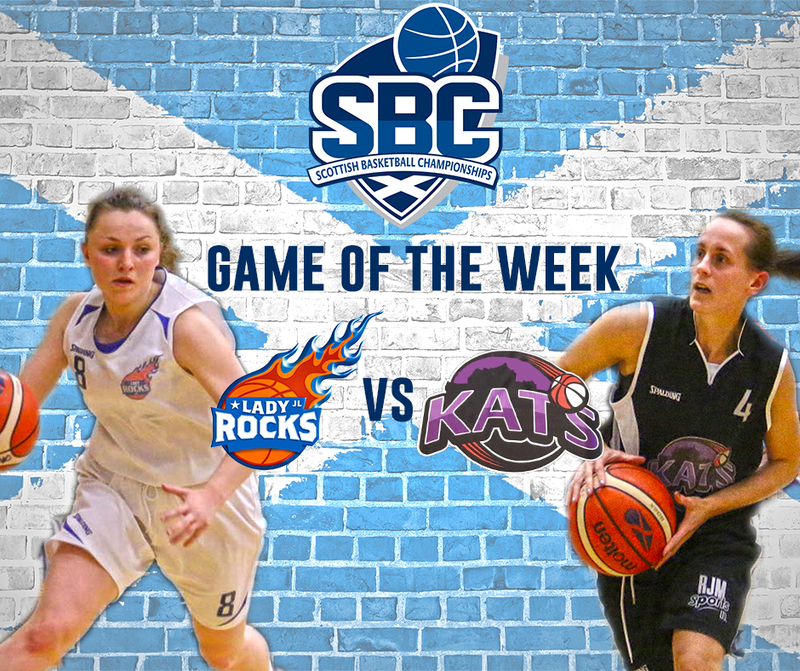 Despite a last-ditch push from Kats, there was little they could do with the score in Rocks’ favour, and the game finished with Rocks coming away with the 78-73 victory. Erin Gilbride finished the game as Rocks’ highest scorer with 26 points, with Carla Coll also adding 20 points, Cathy Mitchell adding 15 and Nadelle Strain adding 13. Emma Findlay had 27 points for the Kats with Tracey Philips also adding 22 points. In Lady Rocks next game they will host St. Andrews University on the 19th of November while City of Edinburgh Kool Kats will travel away to Tayside Musketeers on the 26th of November.